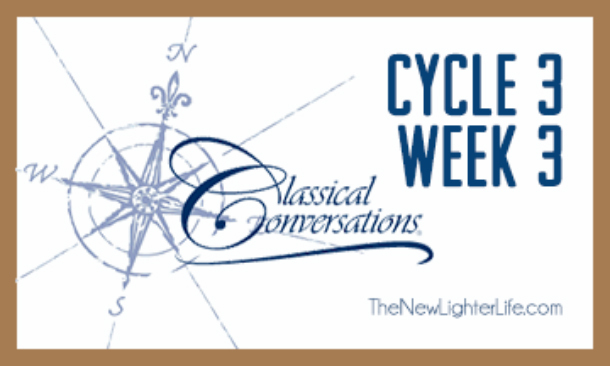 We are venturing into the land of Tin Whistle with Classical Conversations. Today I’m sharing my tin whistle case tutorial. This pattern is super easy and fast if you have more than one to make. 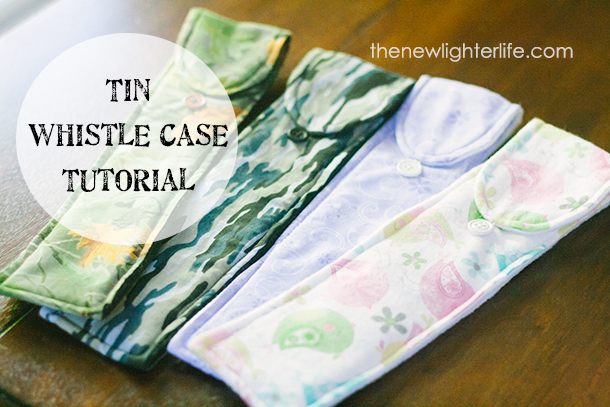 The cases are just the right length for your tin whistle and have fleece for added cushioning. **NOTE: I originally used the elastic cord but due to the fact that the cord is so narrow, it’s difficult for the stitches to “grab” the cord. I repaired a couple of cases with thicker, (but still narrow elastic). 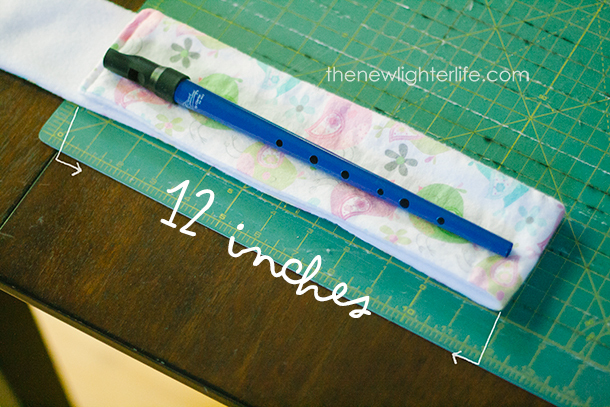 The pictures below show the elastic cord but I highly recommend you use 1/8″ wide elastic instead. Cut both the fleece and cotton fabric to a 3 1/2 inch strip the long way of the fabric. Trim both fleece and cotton to be 27 inches long. 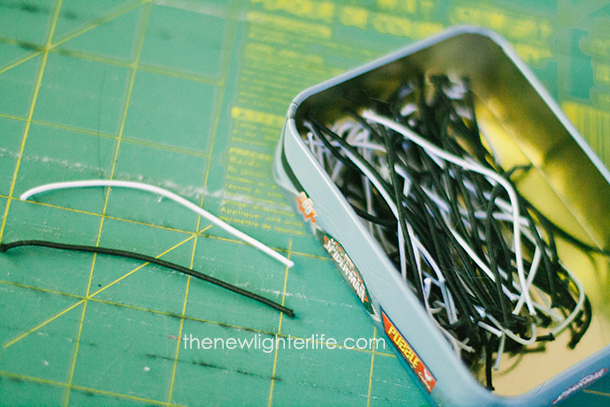 Cut 3 inches of elastic cord, set aside. Layer fleece on bottom and place cotton on top of fleece strip with the right side of the cotton facing the fleece. Take your cut elastic and fold it in half. 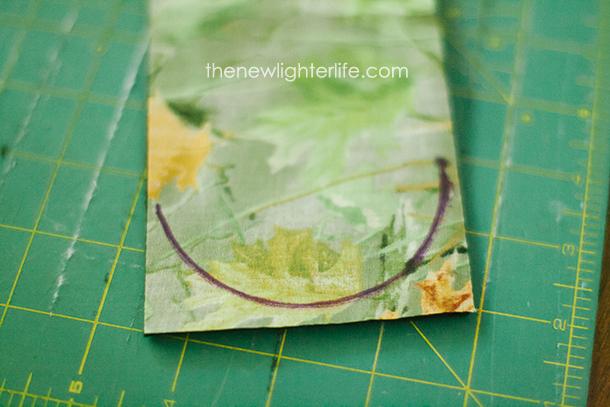 Place the looped end inside the fabric layers. Secure it in place with 2 pins, one on each side of the elastic. Sidenote: I NEVER pin, but in this case it’s important to pin in order to stop the elastic from shifting during the next step. 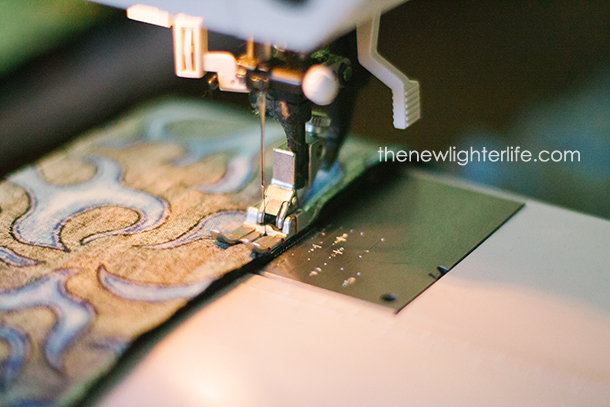 Leave the unmarked 3 1/2″ end open and sew a 1/4″ seam allowance. When you reach the semi-circle marked end, curve around using your marking as a guide. 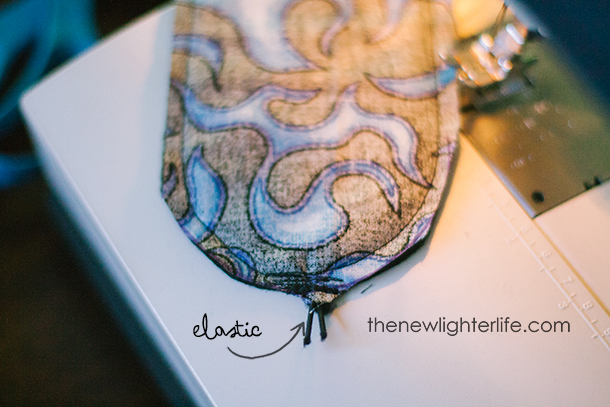 Reinforce the elastic by sewing back and forth directly over the elastic like a crazy person. Seriously. *smile* This is very important for making sure it is secure. Trim the curved end of fabric, leaving the excess cording, (just in case any repairs need to be made to cording). Turn your fabric right side out and iron (I also NEVER iron unless it’s absolutely necessary…it is in this case). 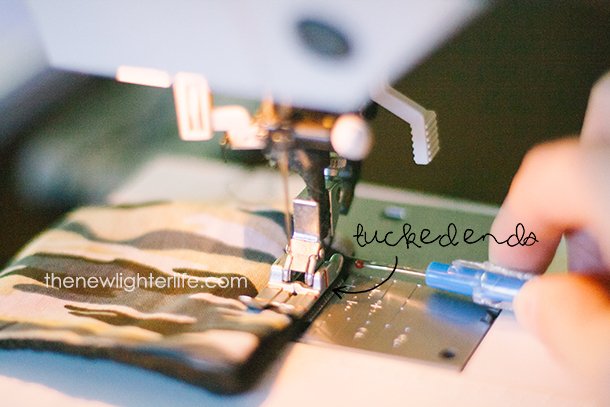 Tuck fabric ends under and sew a 1/4 inch seam to secure the open end closed. Lay your case down and fold it so that the pocket opening to the end measures 12 inches. Turn top flap over and mark where your button will be fastened. 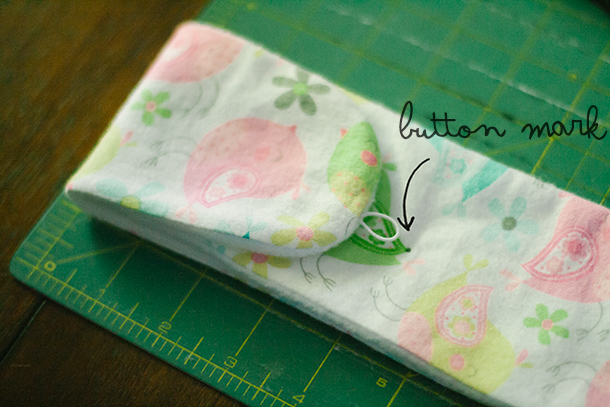 You want to mark for your button hole just a little past where your elastic loop falls. Sew on your button by hand. Line your case up so that it is 12 inches long (for the pocket) again. Starting at the pocket opening, sew at 1/4″ (make sure to backstitch at both left and right openings) all the way around the case including the opening flap. 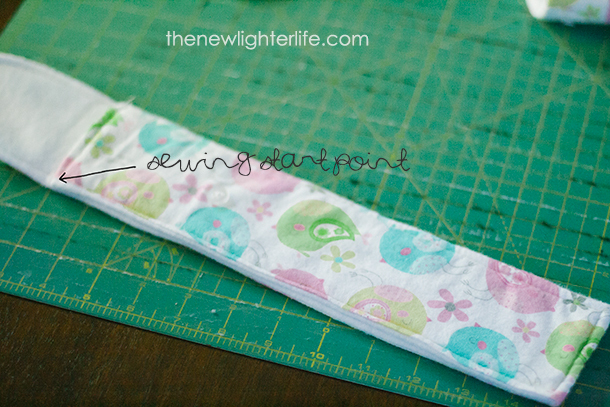 Your stitch should stop where you started to sew. I tried to be very detailed in how I made these. I made about 30 of these for a fundraiser in our community and this was fastest and easiest way I came up with. 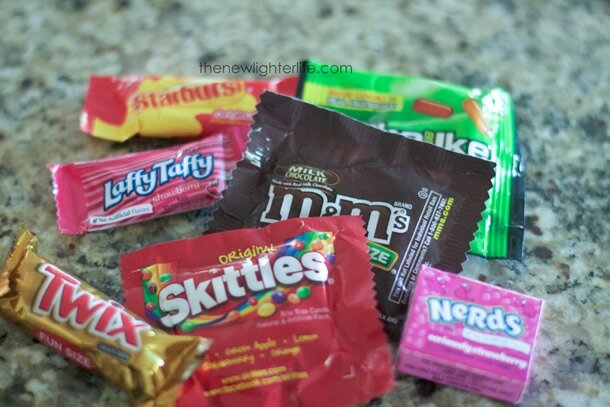 You could add a tag to write a name…customizations are endless on these! 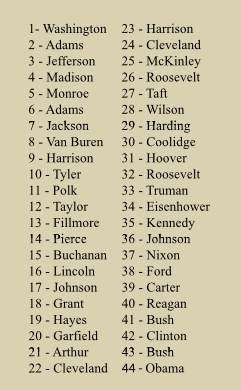 This year is our first year doing Classical Conversations and we’re learning the U.S. Presidents and their order. 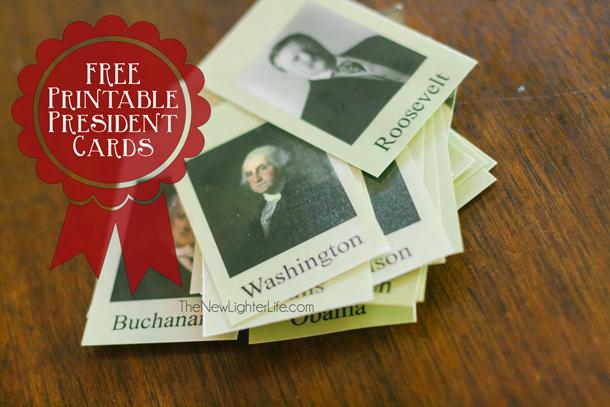 I needed something handy and with one President per card so today I’m sharing the U.S. Presidents Miniature Cards – FREE Printable I made up. We’re listening to the CC Song and they are learning the order…soon they’ll be using the cards to place them in the correct order. I know we are early in the year but I like that we can be prepared ahead of time. The last page has a card containing the answer key…because you know…I need to know the answers. (My children are smarter than me). Ha! So without further adieu…here are my U.S. Presidents Miniature Cards for your viewing and printing pleasure. Click link below to open PDF file for printing. 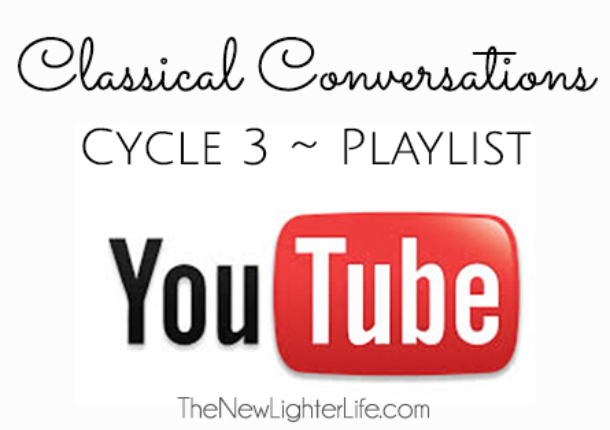 Today I’m excited to share with all of you fellow CCers my Classical Conversations Cycle 3 YouTube playlists. I’ve gone through and watched most of the videos on my playlists, BUT you may find some of them inappropriate for younger children. Basically…please use your discretion. I recommend you view the videos before you show them to your children. There are some weeks that have only 1 video some have more than 11. Certain subjects are extremely sensitive given how recent they occurred, (September 11th) and I was unable to find appropriate videos. These playlists are a work in progress and I’ll be updating them throughout the school year. 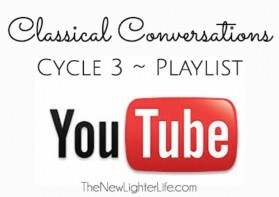 To avoid copyright issues, I purposely did not put videos in my playlist that actually contained CC memory work. 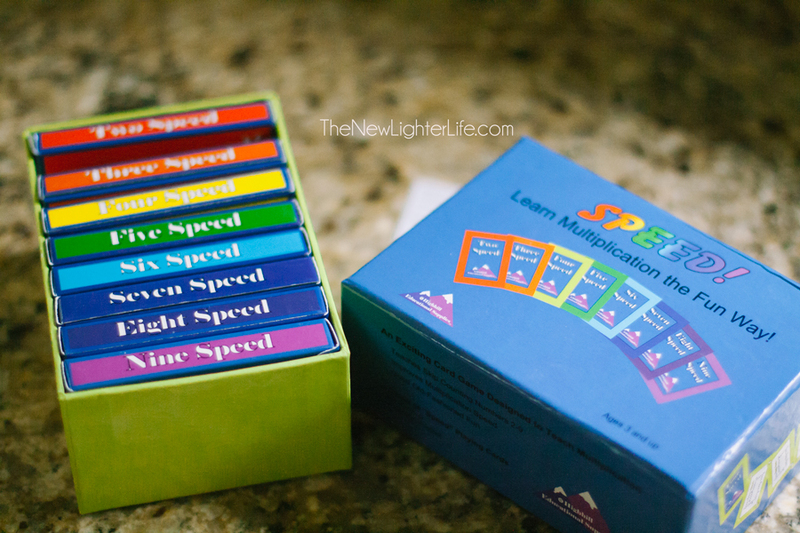 I look at these videos as supplemental information for my children. 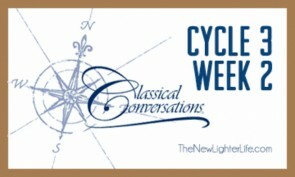 If you have any to add to a particular week, I’d love to hear from you! For access to the Playlists, please click here or click the image above. For our Classical Conversations Cycle 3 Week 4, we got to explore the Declaration of Independence. There are so many wonderful videos for this part of our history that we’ve been watching all week. For my non-readers… my whiteboard. The P with a circle is the symbol for published and the rest should be self explanatory. (at home) The Story of the World: Vol. 3 , Chapter 22, Pg 213-217. I tried to help explain the different verb tenses by drawing little arrows on my whiteboard coinciding with the tense. I also incorporated hand motions to explain what the tenses meant. 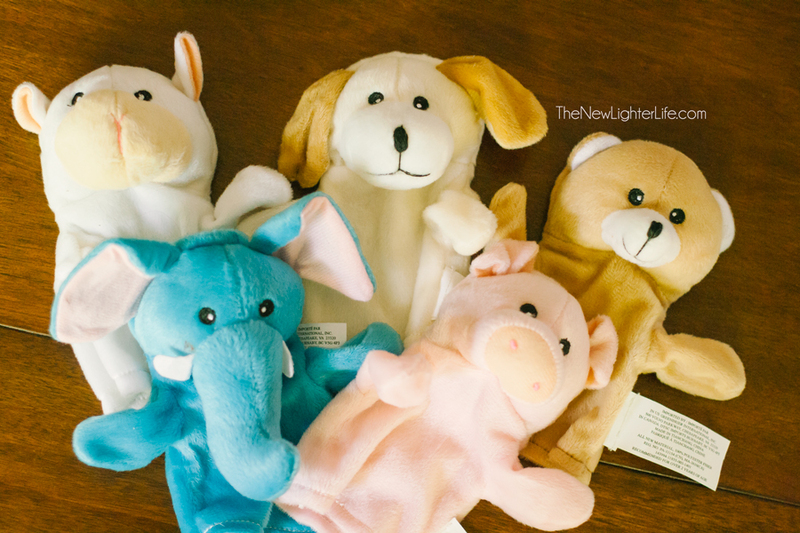 For Latin this week, I pulled out some of my hand puppets. 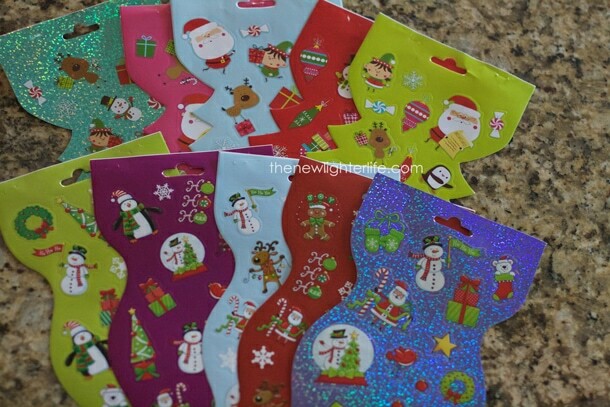 Check them out…aren’t they CUTE?! The bear one is named Perhiberet (bear). Just make sure to explain what bear actually means in Latin – something I forgot to do but later reminded my parents in my email to them. The children got to raise their puppet or object when we said their part. This was so fun for them and I’ll be incorporating them as much as possible! 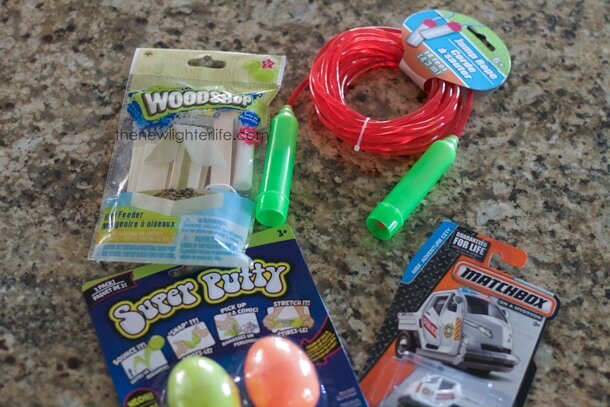 I got them a week or 2 ago from Dollar Tree so they may still be there! Again I followed the helps from “Hissheep” off CC connected and tailored them to my puppets and hand motions. (at home) We made a model of a spine with egg cups, straws, and tape. So easy and the kids liked the hands on aspect. We covered the fact that they are many more vertebrae than 18 in our spinal column and what parts of the model would be parts on their spine. I also read the the Science Snippets when the model was built and talked about our nerves. Abstract Art. Oh my…I’ll be honest and say this wasn’t my favorite lesson. After a brief explanation, I had the children draw a continuous line, a big and swirly line that overlapped. Next I had them color in different blocks made by that line with bold colors. For their next project, I wrote their names in an abstract manner, (turning the page for each letter of their name) and then I had them color in those different sections. For the science project this week, we made a model lung. So many great lessons from this week from our previous Science grammar! If you make this model, be sure to use a sturdy water bottle. We went with a Evian but the plastic is thinner so it would collapse, (Dasani is strong enough). Golf, Tutor May I, & Sprints were our games for review. I had some energetic children this week and I think it would have been better to reverse the order of the games personally. So why so many games this week? Well I’m glad you asked! As I said the kids were a little more squirrely this week and they got very tired waiting for their chance at Tutor May I. Next time we play, I’ll let everyone do the action the review question is asked if we have wigglers. We finished up our review time with the children lining up and me asking them a question one at a time. After they answered the question, I sent them on a sprint down the sidewalk and back. Ahhhh, what a release for them! 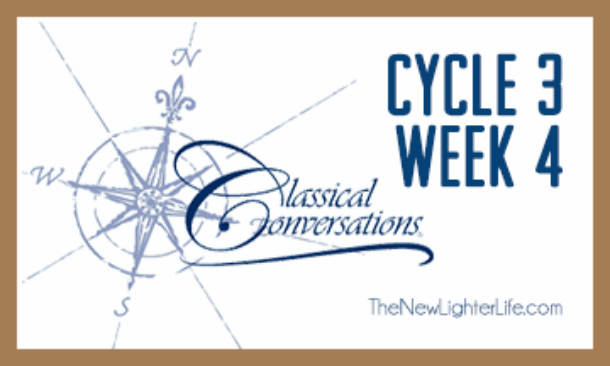 Our Classical Conversations Cycle 3 Week 3 went off without a hitch! 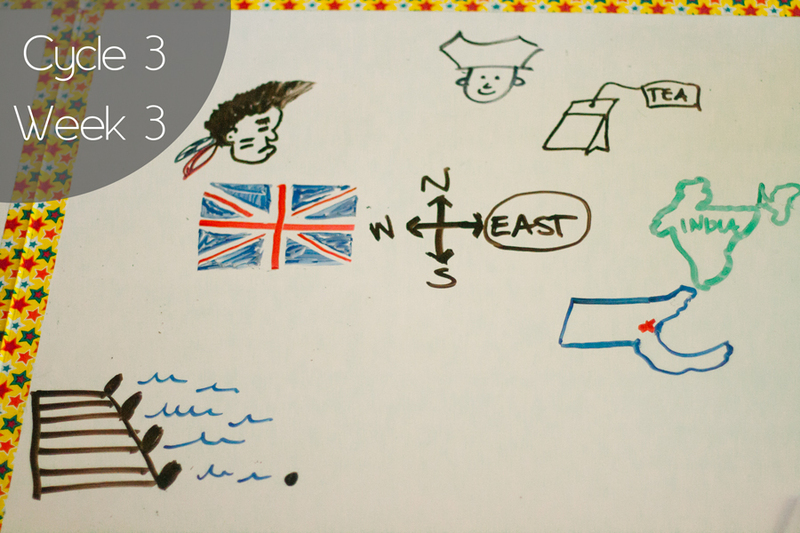 This week I delved into my artsy (or not artsy side) for History. Also, I’ve followed all the wise advice from those who have gone before me in tutoring for Classical Conversations. Their advice: KEEP IT SIMPLE. So with that, we are doing pretty much the same thing every week. And for this reason, I’ll only share what we’ve done different from our previous weeks. Here are the highlights from our week…. My disclaimer is that I’m NOT an artist. (so NO picking on me!) But here is the “art” I used to convey the message of the history sentence and to try to help my non-readers remember the sentence. The wording has been removed to stay within copyright laws of CC. Another tutor at our community had the children act out the history sentence. She brought in tea bags and had the students throw the tea at a map where the Boston Harbor is located. My girl LOVED it! (at home) The Story of the World: Vol. 3 , Chapter 22, Pg 208-212. (at home) Now is where I get very real and tell you that I pushed my older 2 kids in the Math department. They are doing multi-digit multiplication right now but they are struggling with single digits. We’ve put our books away for a time and are strictly focusing on multiplication. But I’ve been looking for fun ways to hammer these facts in instead of just drilling. My kids have a great time with this, though it is a little too advanced for my 4 1/2 year old who is just learning her skip counting facts. Someday, I’d like to create cards to cover 10’s through cubes for week 11 of CC. I’ll update if I ever tackle that. I simply have to share the song I used this week, “Winnie the Pooh.” It was perfect for my 4’s and 5 year olds. The song on CC Connected was uploaded by “carolynsigg” it was incredibly helpful! I also incorporated a hybrid from the helps “Hissheep” uploaded to CC Connected and my own hand motions. I’ll admit, I was a little scared of this week’s Latin, but the combo of the hand motions, song, and helps made it stick both in class and at home. We covered upside down drawings this week. For my little ones, I wrote their names and had them attempt to write them upside down. This was a challenge for them to be honest. I also brought in a handheld white board to be able to flip the image right side up when we were done. I drew a simple turtle image for the kids and we took turns writing on the board for the remainder of our time together. I hit on different elements of drawing to reinforce OiLs. (at home) We looked at these animal fingerprints and it was pretty fascinating! Check out those Koala prints! 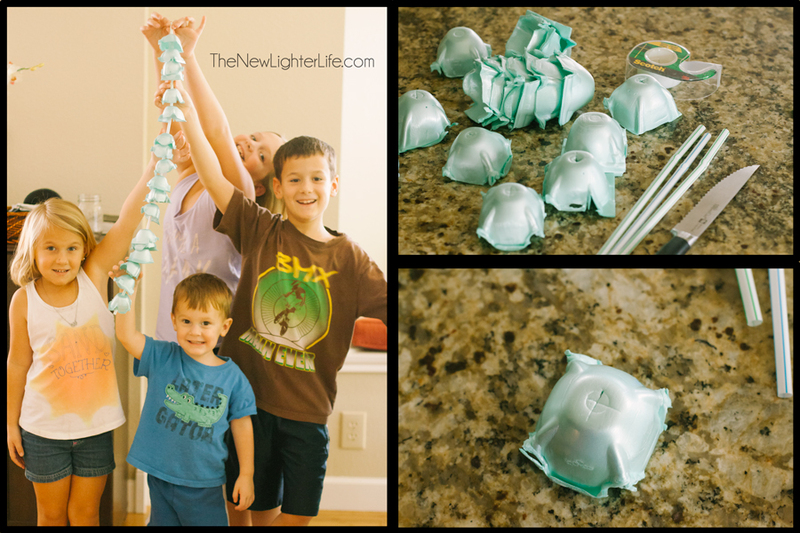 This week we played the cup game with little 2 oz dixie cups. 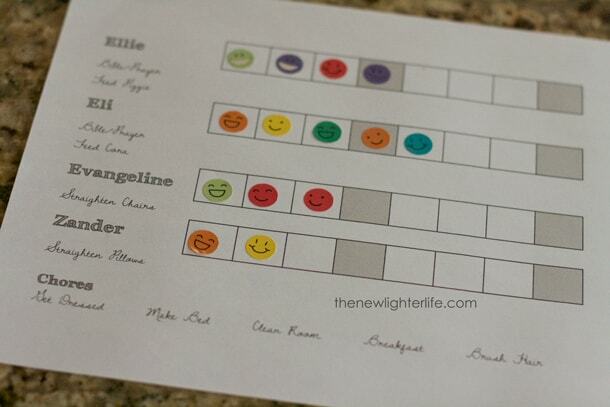 I’m a sloppy writer so I printed my labels on my tiny Avery Labels (05267) . 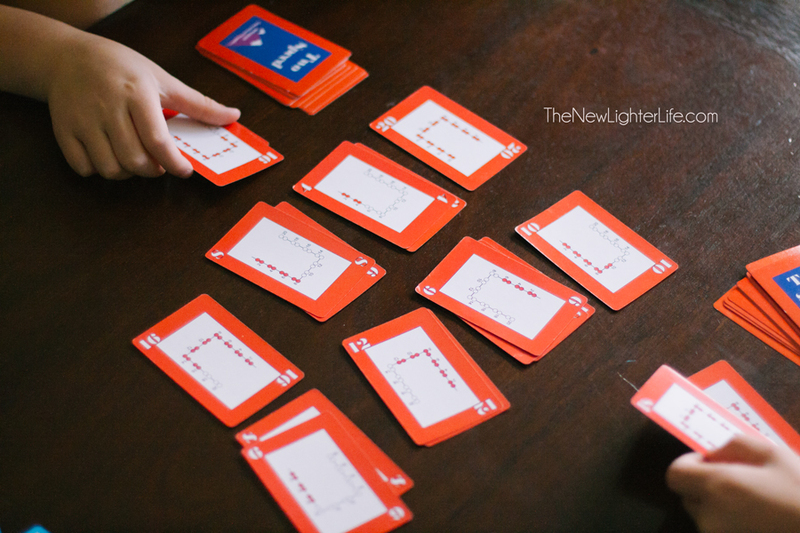 I get a sense that my Abecedarian group is not competitive so we didn’t have winners or loser. 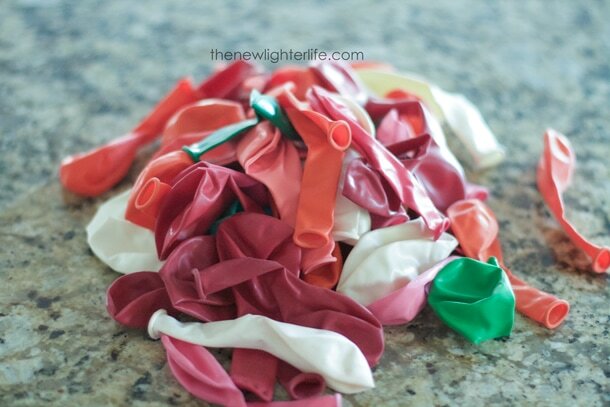 But the children were pretty motived to get to knock those cups down with my foam Dollar Tree ball. Here is the breakdown of what we did for Classical Conversations Cycle 3 Week 2. 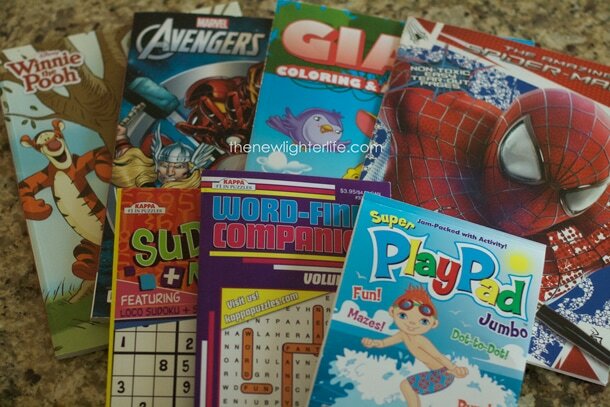 I’m personally loving the material and extra sources for supplementing our curriculum! (at home) For review, we printed these super cute maps to color in as we learn all the states and capitals. (at home) I LOVE the “Timeline Tidbits” that the user: bentkitchen put up on CC Connected. They are perfect for my little 4 1/2 year old. (at home) The Story of the World: Vol. 3 , Chapter 6, Pg 60-69. I used the English song for week two from the user, “marykbry”. LOVE her songs! We sang and chanted the Latin grammar this week. 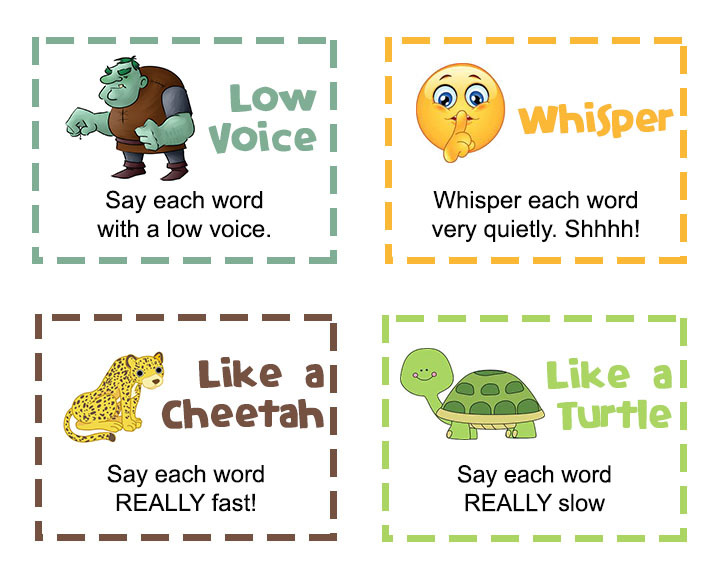 The children and I got creative with it and used “LOW Voice” and “Robot Voice” from I Love to Teach. I made another sheet following her adorable design. We sang the math skip counting songs while doing arm circles and stomping our feet. This week it was all about mirror images. The children really liked this one! I handed out the images from ArtMadeEasy.com. 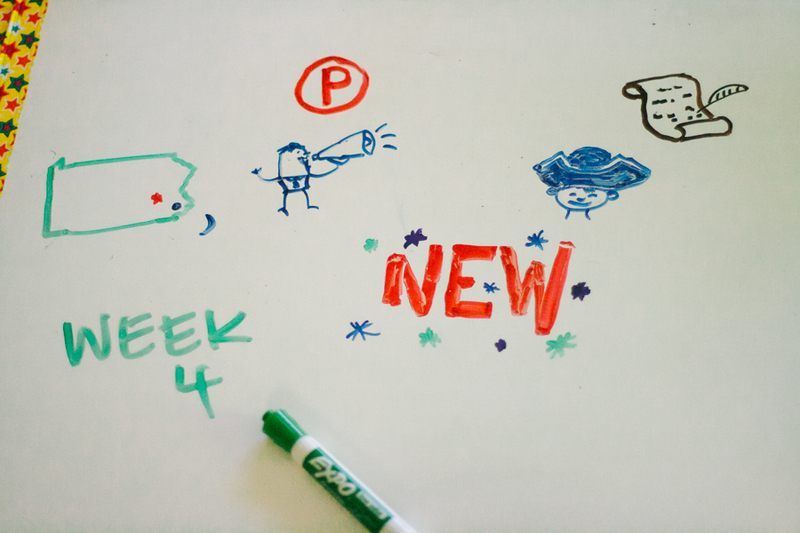 Next, we drew on the white board. I drew one half of the image first, then I chose one of the children to complete the mirror image. 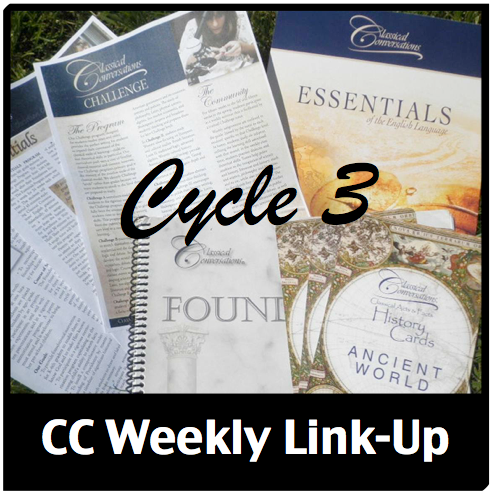 This post has been linked up at Half a Hundred Acre Wood, to see more for week 2, click below.